The landscape of Tuscany is littered with tiny hill towns. Many of these enclaves are not well known outside of the immediate area (Torrita di Siena), while a others appear as regulars in the guidebooks (San Gimignano). So, how do you know which ones to investigate and which ones to ignore? Not the answer you were expecting? 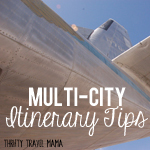 The truth is, that even though I travel often and trip logistics is a hobby (okay, obsession) of mine, I still end up overwhelmed. Too many options, too little time! Don’t worry – I won’t leave you completely in the dark. 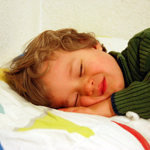 Here are two approaches that will help you sort through the list. What? You have no list yet? 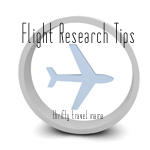 Consult your nearest Lonely Planet, Best Small Towns in Italy or Wikipedia. With three small kiddos, this it the method I use most. Punch your villa / vacation rental / hotel location into Google maps. Zoom out a bit until you can see the surrounding location names. Use the driving directions feature for any towns not immediately visible. And since location and transportation go hand in hand, don’t forget to factor how you will get from your lodging to your day trip location. I am a big fan of public transportation, but I have to say that in Italy, I much preferred to go by car to the small towns. Be advised that if you’re traveling roads other than the autostrada (interstate with tolls) or the raccordo (highway), driving times will be longer than what is shown in the search results. We limited our list to locations one hour or less by car. Travel by bus in Italy is intermittent and rarely on time. Train travel is better, and if you choose this method you’ll have any easy time narrowing down your list as few hilltop villages feature railway stations. What are your family’s interests? Love wine? Try Greve in Chianti. 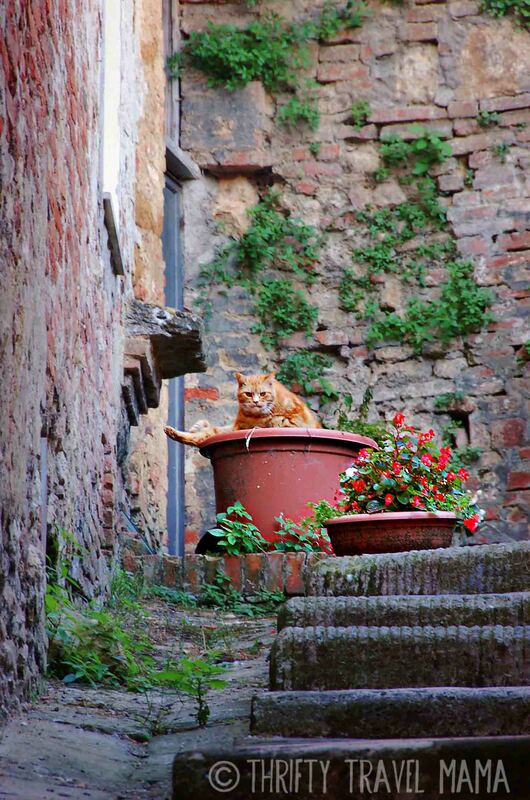 Enjoyed Under the Tuscan Sun? Don’t miss Cortona. Into religious history? Stop in Assisi. 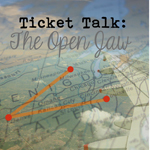 Find out what each town is known for, and narrow the list from there. 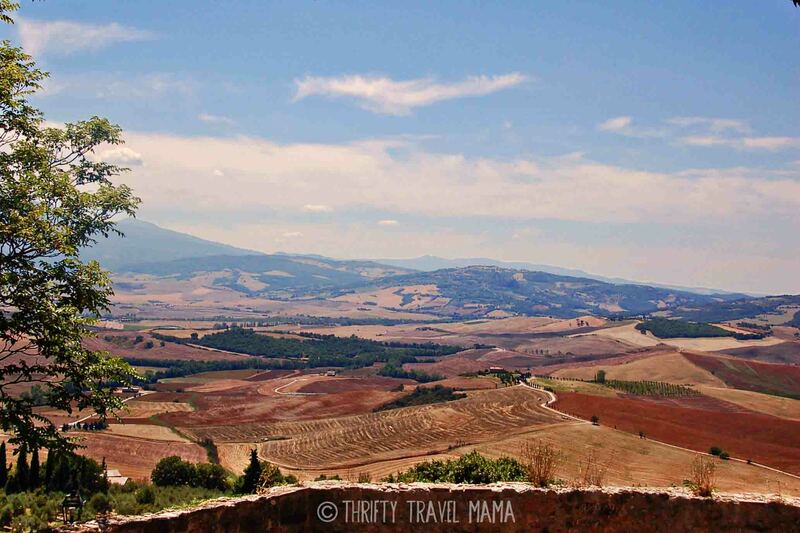 Today, I’d like to feature three hilltop towns we explored: Montepulciano, Pienza, and Lucignano. Montepulciano surprised me with its attractive alleys (really! ), quiet streets, and unique shops. As we trekked up the shockingly steep streets, I felt like REAL people lived here despite the obvious presence of tourists and souvenirs. 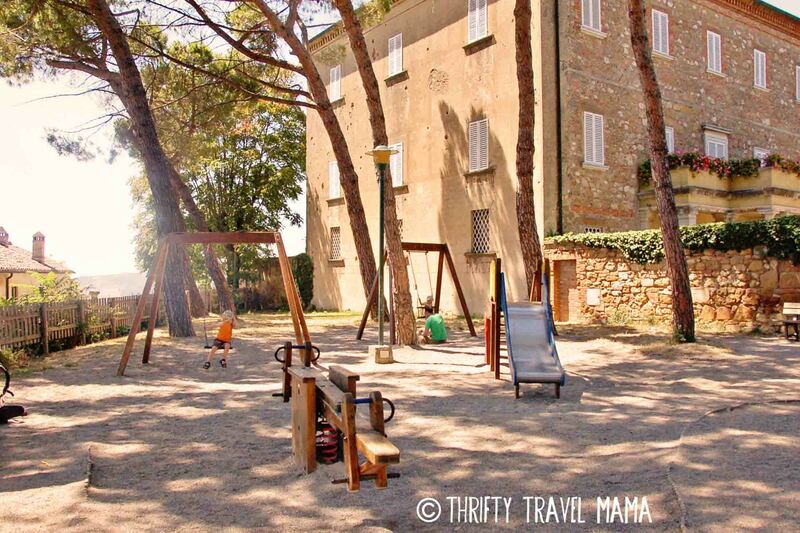 Perhaps as evidence, we happened upon two playgrounds frequented by Italian families. 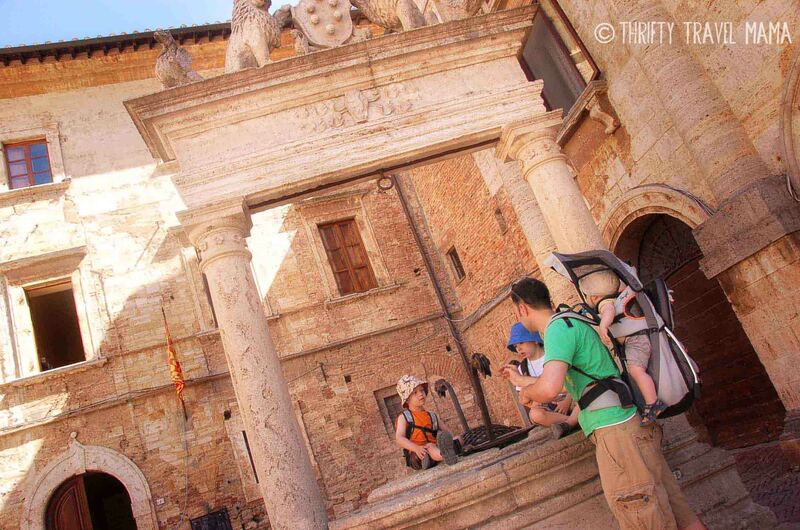 We did not, however, see many children on the streets of Montepulciano. One possible explanation is that cars are not banned in the city center. Sure, these areas are technically pedestrian zones. But, I never felt comfortable letting go of my child’s hand for fear of being run over by the constant stream of trucks and whizzing Vespas squeezing through the narrow lanes. 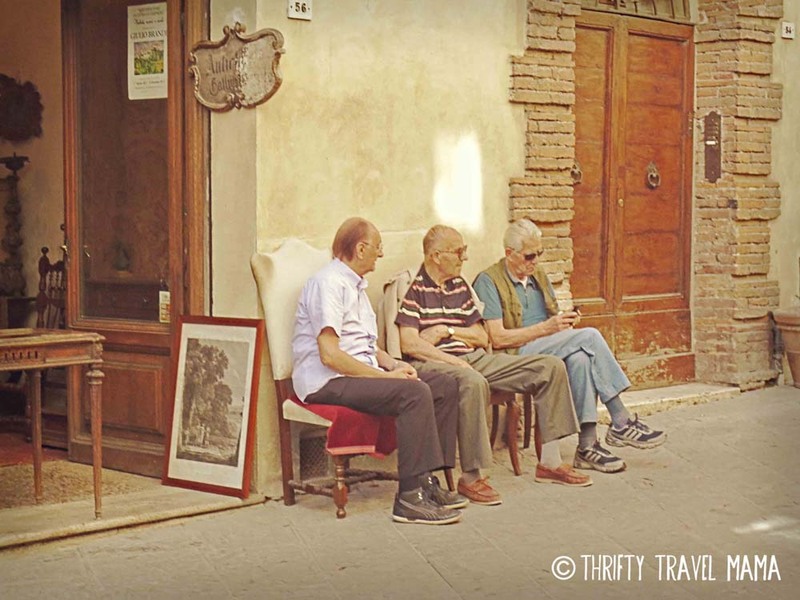 Alas, this is Italy – and we quickly grew accustomed to the perpetual hand holding. Of all the landmarks in Montepulciano, T-Rex and Screech enjoyed the well at the Piazza Grande the most. Doc Sci went all nerdy on me trying to explain the physics of lowering and raising water-laden buckets. I tried to admire the architecture but found it difficult to ignore the twenty gazillion plastic chairs and concert equipment mucking it all up. 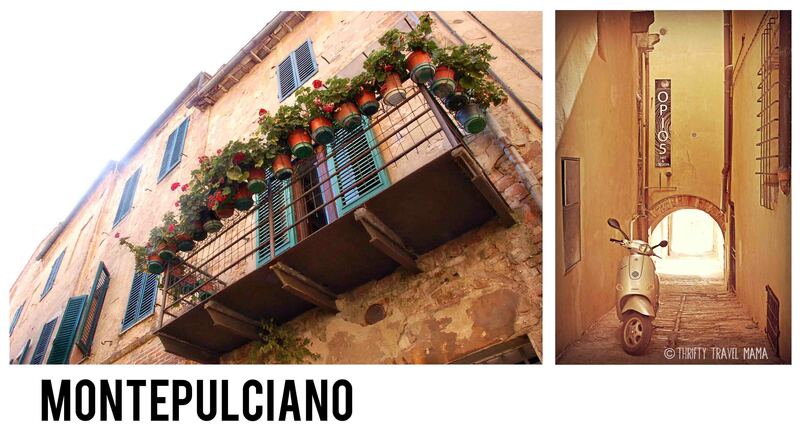 Montepulciano is known for its wine, so savor a glass or buy a bottle to go. 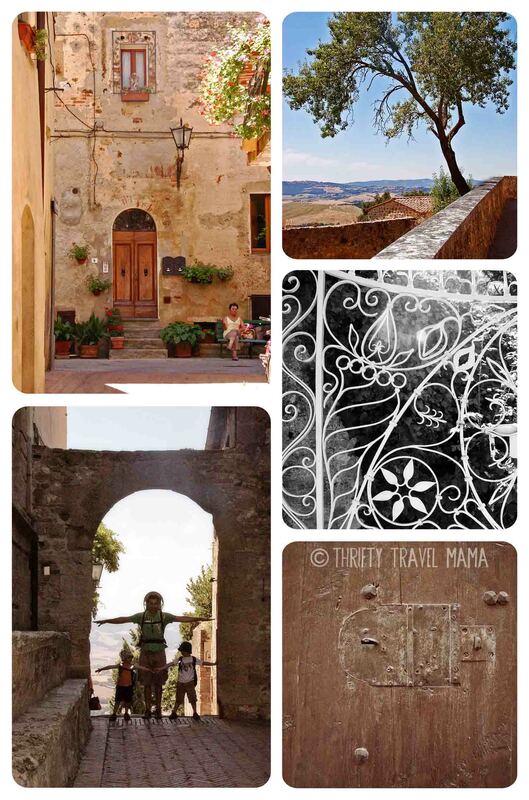 Pienza was designed to be the “perfect” Renaissance town (more history and why it’s a UNESCO World Heritage site here). The architecture is lovely for sure; but, best of all, it’s flat and quite small. In fact, if you don’t stop to gawk or eat, you could walk the entire thing in 30 minutes or less. The centro storico is a treat for art or history buffs… that is, if you can manage an eyeful in between the crowds. Better to wander behind the main square and catch a breathtaking view of the Val D’Orcia landscape. Besides a great spot for a family photo, this punto panoramico is an excellent area to give your nose a rest. 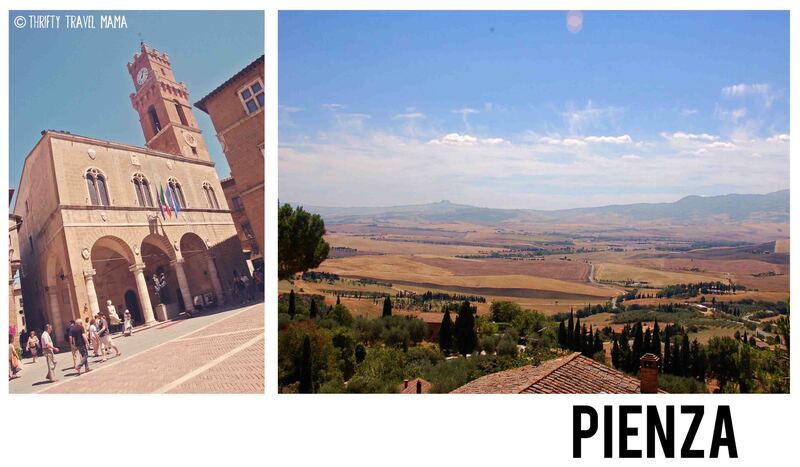 Pienza is known for its pecorino cheese, and they’ve got the stench to prove it. If you don’t mind the odor, feel free to sample the different varieties offered in the shops. But hold on to your pocketbooks and purchase your edible souvenirs at the grocery store across from the Agip gas station on the SS146. 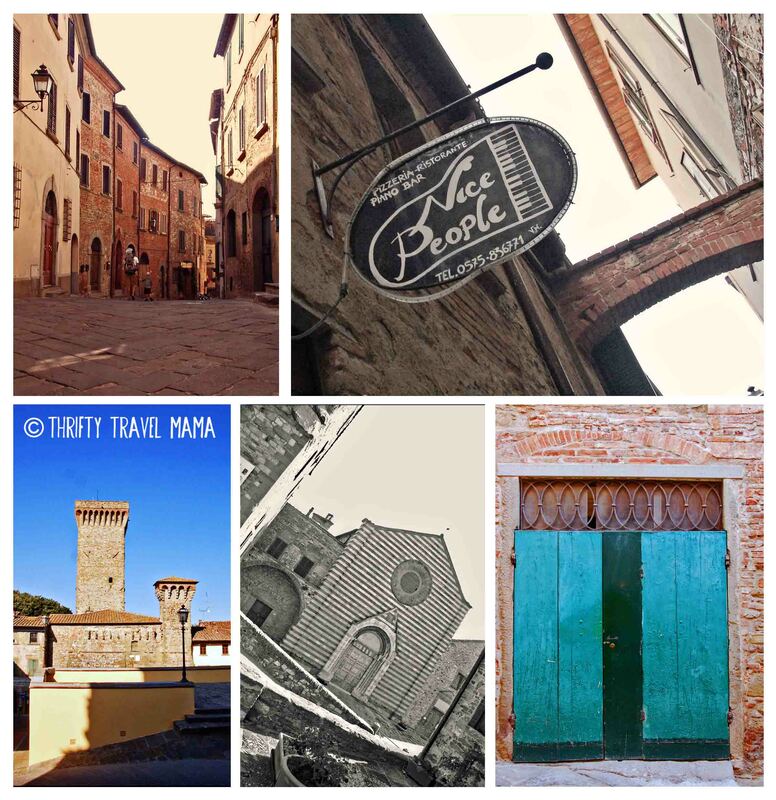 Other than a decent playground on Via Enzo Mangiavacchi, we didn’t find many hidden gems in Pienza. I’d say the village is worth a quick stop especially if Renaissance architecture is your thing, but refrain from making it the star of your day. Prior to researching villas, I’d never heard of Lucignano before. We ended up booking Casal Gheriglio which lounges at the foot of the hill. On one of our hang-out-and-do-nothing days, we decided to wander up and have a look. What a treat! Billed as a model example of how medieval towns should be, we appreciated the orderly streets… with nary a tourist in sight. Lucignano was a breath of fresh air after the chaos of Siena and the crowds of San Gimignano. If museums and shopping are what you’re after, look elsewhere. 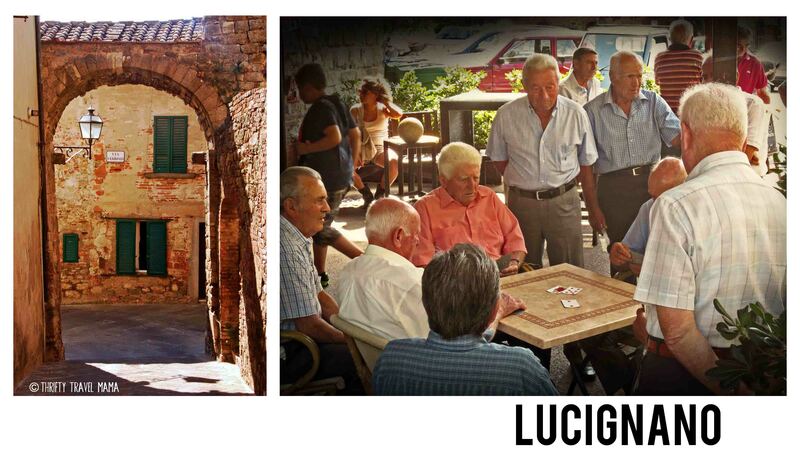 Lucignano hasn’t yet been overrun by tourism. The locals do have to eat, so you won’t be without a trattoria, pizzeria, and gelateria. But, streets are hushed, and the most interesting thing to do here is burn up your camera taking photos… which is just fine with me. This post is part of Our Tuscan Family Adventure: Two Weeks of History, Culture, Food, and Fun in Italy series. 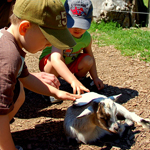 Click on the link to view our bucket list and recaps of each excursion! 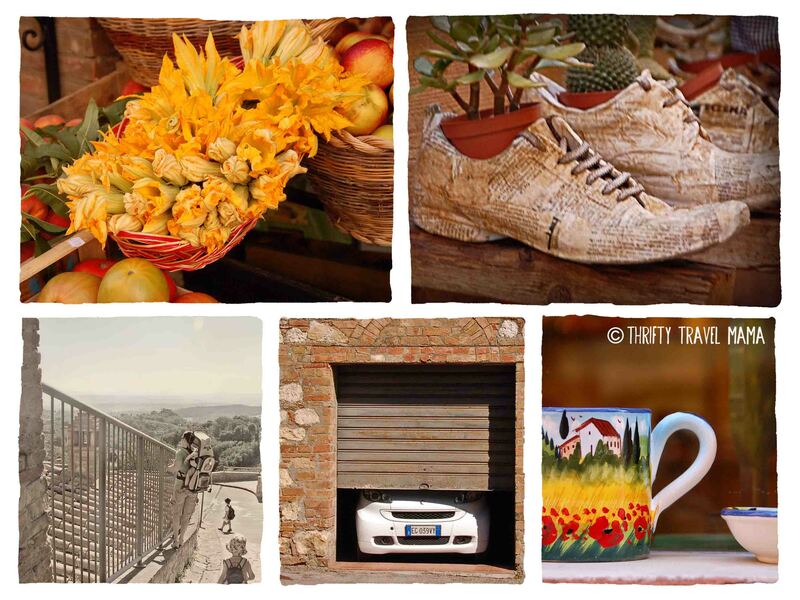 This entry was posted in Big Trips and tagged amazing views, cheap, day trip, Doc Sci, driving, getting around, Italy, itineraries, planning & research, road trip, San Gimignano, serendipity, traveling with kids, Tuscany by thriftytravelmama. Bookmark the permalink. I love the one where everybody’s standing under the arch with arms outstretched. But really, it sounds like a great little run through the place! Quiet and with lots of photo ops sounds just fine to me, too. We’re headed to this region with two littles in tow soon. This is exactly our style of travel: drive wherever is within reasonable reach. I’m so glad to see we can enjoy Montepulciano – it has been highlighted in my guidebook for a while now.